For all rising 2L students enrolled UF Law on or before June 20, 2018 who are interested in joining the Florida Moot Court Team, please add the “Moot Court Intramural Tryout Competition 2018” course on TWEN. For all rising 2L transfer students who were admitted to UF Law after June 20, 2018 and are interested in joining the Team, please contact Brandon Cook at brandoncook@ufl.edu to get involved in the Competition. 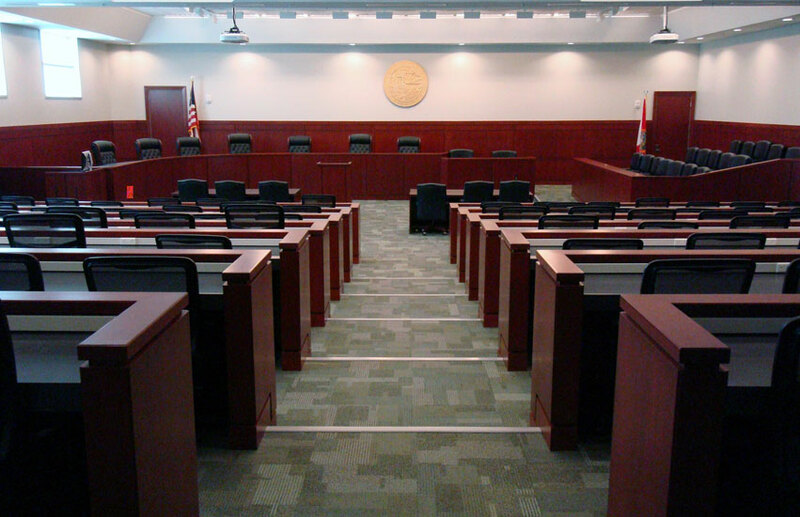 The Florida Moot Court team provides a unique, unparalleled law school experience. By engaging in both appellate writing and oral advocacy skills, our Members develop skills that are applicable and relevant to the practice of law. All rising second-year law students or joint degree-seeking students with four semesters remaining are invited to compete. Students must be in good academic standing with the University to be eligible to participate in tryouts for Moot Court. Students must also have already completed the Appellate Advocacy course. The tryout process will begin with an Informational Meeting, which is held in the spring each year. At the meeting, members of the Team will describe the format of the Intramural Competition and field questions from interested students. Students interested in trying out for the Moot Court Team in our Intramural Competition will deliver oral arguments in the Martin H. Levin Advocacy Center. The Intramural Competition is the team’s method for selecting new members. It is an endeavor that we take very seriously, and we make every effort to ensure that the process is fair and unbiased. New members are selected anonymously and are based entirely upon numerical scores. The team will extend an invitation for membership to ALL competitors deemed capable of representing the Levin College of Law in intercollegiate competitions. Therefore, there is no set number of new members that we take every year. The competition is designed to showcase the entire range of appellate advocacy skills necessary to compete at the national level in Moot Court competitions, as well as in appellate practice. Students trying out for the team must submit an appellate brief, similar to the one produced in Appellate Advocacy, on a topic the team has selected. All try-out information will be posted on a TWEN page specially created for the competition. The competitor may choose to write for either the appellant or respondent. After the brief has been submitted, the competitor has a set period of time to prepare for oral arguments. Competitors argue against the side they wrote for (off-brief) and then in favor of the party they chose to write for (on-brief). Although both arguments are ten minutes long, the off-brief oral argument is worth only twenty percent of the competitor’s overall score while the on-brief oral argument is worth forty percent of the competitor’s overall score. The brief comprises forty percent of the competitor’s overall score. At the end of the competition, the team decides which new members to accept. The rules of this competition, which are designed to ensure fairness, will be strictly enforced. Any competitor who fails to abide by the competition rules will be automatically disqualified from the competition. After the team picks its new members, the top four finishers and one alternate compete in what is known as “The Final Four,” sponsored by the law firm Zimmerman, Kiser & Sutcliffe, P.A. In teams of two, the competitors present oral arguments in front of federal and state judges. Photo courtesy of FlaLaw Online: the 2015-2016 Florida Moot Court Team and the Florida Supreme Court following Zimmerman Kiser Sutcliffe Moot Court Final Four Competition. Awards are given at the end of the competition to the best team, best oralist, and best overall competitor. A best brief award is also given out to new team member with the highest brief score, a person not necessarily selected for the Final Four. Winning briefs from past competitions are available on TWEN. The arguments are open for observation by fellow students, alumni, and faculty, so competitors often argue before both a prestigious panel as well as a sizable audience.